Dr Teal’s Aluminum-Free Deodorant is clinically proven to absorb wetness plus fight odor all day. Our formula harnesses the strength of Magnesium, an essential mineral for your body and a powerful deodorizer, and contains Arrowroot powder and Baking Soda for all-day wetness absorption. Infused with Essential Oils, Coconut Oil, Jojoba Oil, and Shea Butter to leave your skin smelling and feeling great all day. Use body heat to soften product. Hold product to skin for several seconds. Gently apply desired amount to clean underarms. Dr Teal’s Aluminum-Free Deodorant is clinically proven to absorb wetness plus fight odor all day. Our formula harnesses the strength of Magnesium, an essential mineral for your body and a powerful deodorizer, and contains Arrowroot powder and Baking Soda for all-day wetness absorption. Infused with Eucalyptus & Spearmint Essential Oils, Coconut Oil, Jojoba Oil, and Shea Butter to leave your skin smelling and feeling great all day. Dr Teal’s Aluminum-Free Deodorant is clinically proven to absorb wetness plus fight odor all day. Our formula harnesses the strength of Magnesium, an essential mineral for your body and a powerful deodorizer, and contains Arrowroot powder and Baking Soda for all-day wetness absorption. Infused with Lavender Essential Oils, Coconut Oil, Jojoba Oil, and Shea Butter to leave your skin smelling and feeling great all day. 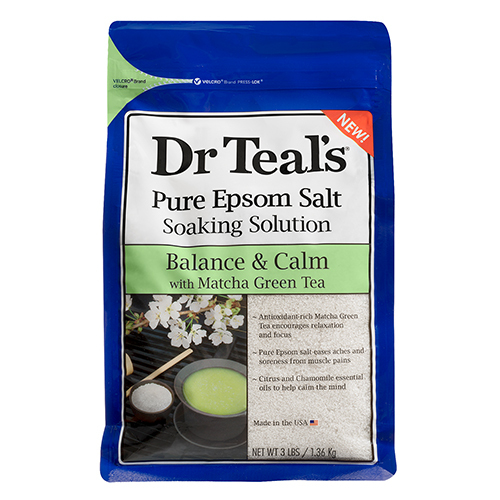 Dr Teal’s(R) Soaking Solution harnesses the power of antioxidant-rich Matcha Green Tea to provide a relaxing bath. This calming soak combines Pure Epsom Salt with Matcha Green Tea to encourage relaxation and focus, leaving you feeling refreshed and renewed. A soothing blend of Citrus and Chamomile essential oils calm the mind and help provide relief from stress. 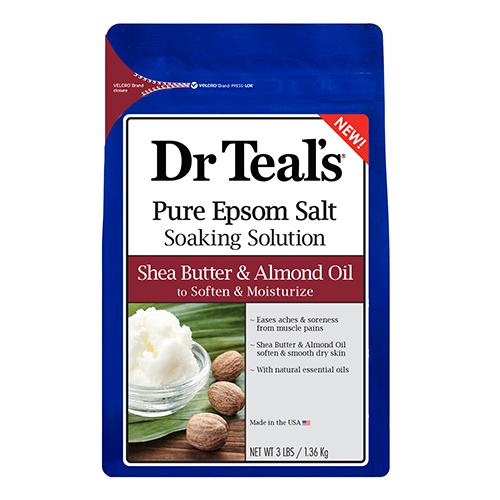 Dr Teal’s Soaking Solution combines Pure Epsom Salt (Magnesium Sulfate USP) with Shea Butter & Almond Oil extracts to help ease sore, achy muscles while moisturizing the skin. This extra rich skin caring formula has added natural essential oils, known for their ability to help soothe the senses, clear the mind and help provide relief from stress. Dr Teal’s Muscle Recovery Soak combines Pure Epsom Salt with a blend of Menthol, Arnica and essential oils to soothe sore muscles and ease aches and pains. This unique formula works together to restore your muscles and help your body recover. Soak with Dr Teal’s Muscle Recovery Soak for 20 minutes after exercising or physical activity and allow the rich minerals to soak away discomfort. Available in 2lb. bag in Topical Pain Relief section. 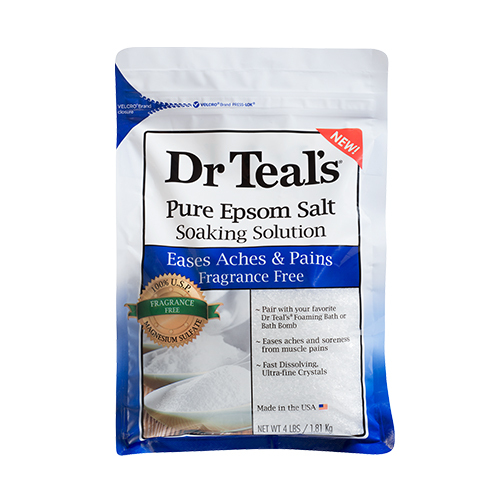 Dr Teal’s® Soaking Solution combines Pure Epsom Salt, which has long been known to revitalize tired, achy muscles, with essential oils to soothe the senses and help provide relief from stress. Lavender essence has soothing properties that are known to promote a better night’s sleep. 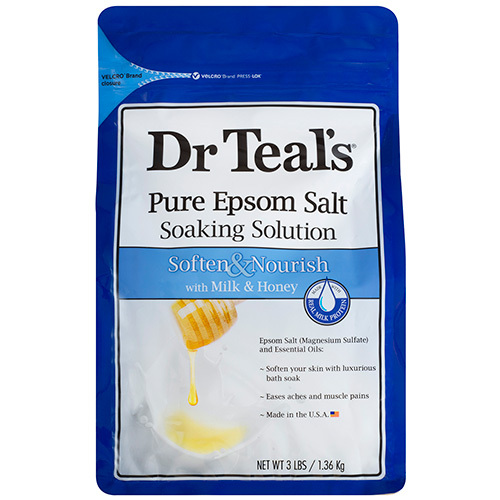 Dr Teal’s® Soaking Solution combines Pure Epsom Salt which has long been known to revitalize tired, achy muscles, with luxurious essential oils to soothe the senses and help provide relief from stress. Spearmint is used as a restorative for the body, while Eucalyptus stimulates the senses. 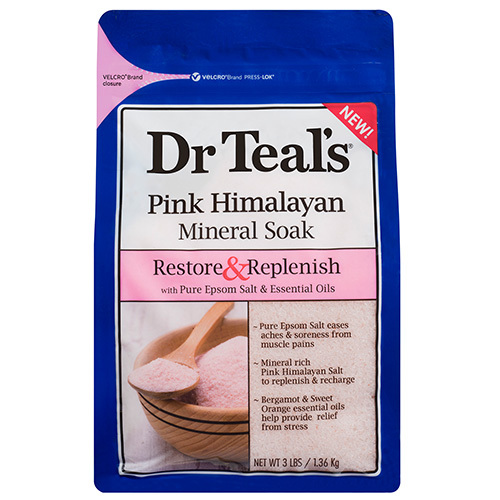 Dr Teal’s® Pink Himalayan Mineral Soak combines Pure Epsom Salt with mineral rich Pink Himalayan Salt to revitalize tired, achy muscles and help replenish your body’s minerals. Uplifting Bergamot and Sweet Orange essential oils soothe the senses and help provide relief from stress. 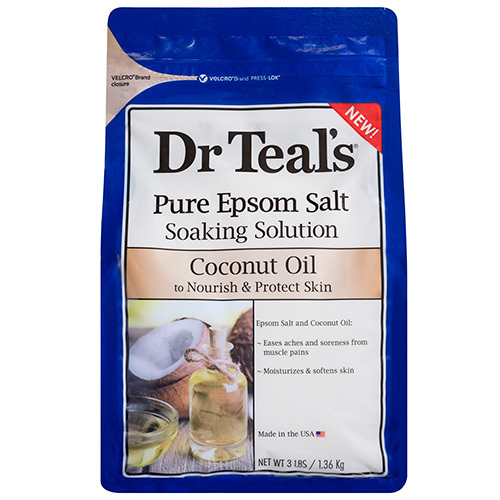 Dr Teal’s® Soaking Solution combines Pure Epsom Salt which has long been known to revitalize tired, achy muscles, with nourishing Coconut Oil to help provide ultimate skin nutrition. Coconut oil essence creates a blissful soaking experience to soothe the senses and help provide relief from stress. 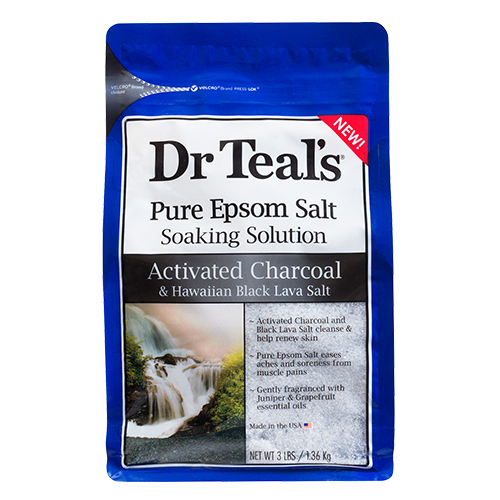 Dr Teal’s Soaking Solution harnesses the power of purifying Activated Charcoal & Pure Epsom Salt to cleanse and detoxify skin. This uplifting soak combines Pure Epsom Salt with Activated Charcoal & Black Lava Salt, known for the ability to cleanse body’s impurities, leaving your skin feeling renewed and revitalized. A refreshing blend of Juniper & Grapefruit essential oils rejuvenate the senses, and help provide relief from stress. Soak in the power of the ocean with nutrient-rich Dr. Teal’s Deep Marine Sea Kelp Mineral Soak with Epsom Salt and Essential Oils to help purify, moisturize and replenish. This unique mineral soak blends Pure Epsom Salt, Sea Salt, Sea Kelp and moisturizing essential oils to ease aches and soreness and help hydrate skin. Lemongrass and Orange essential oils create a blissful soaking experience to soothe the senses and help provide relief from stress. Soak away discomfort from sore muscles: Pour at least 2 cups of Dr. Teal’s Sea Kelp Mineral Soak under warm, running bath water. Soak for 20 minutes, and let the rich minerals soak away discomfort. 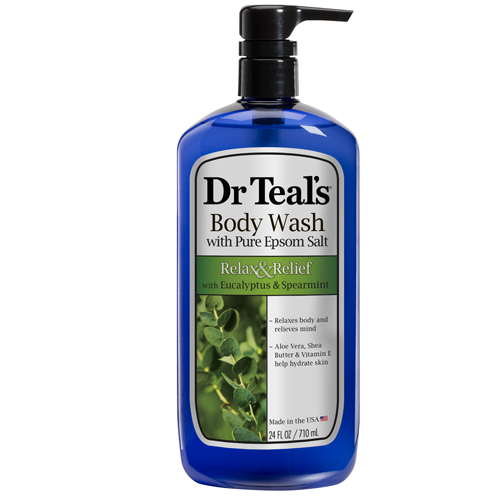 Exfoliate your skin: Mix a handful of Dr. Teal’s Sea Kelp Mineral Soak with a handful of your favorite Dr. Teal’s Body Wash. Gently massage mixture onto skin to slough away dry patches, revealing a healthier-looking complexion. 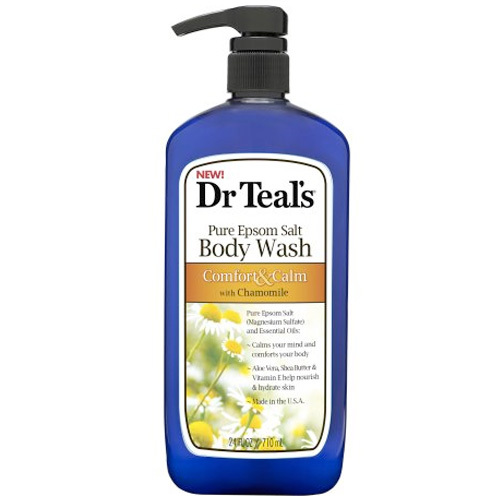 Dr Teal’s Deep Marine Sea Kelp Body Wash, 24 oz. 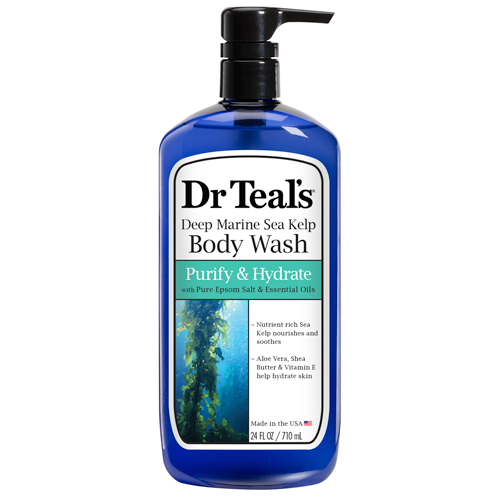 Dr Teal’s Deep Marine Sea Kelp Body Wash hydrates and conditions skin. Aloe Vera, Shea Butter and Vitamin E moisturize while Pure Epsom Salt (Magnesium Sulfate USP) helps revitalize tired achy muscles. Nutrient rich sea kelp helps purify and hydrate while uplifting lemongrass and orange essential oils soothe the senses. 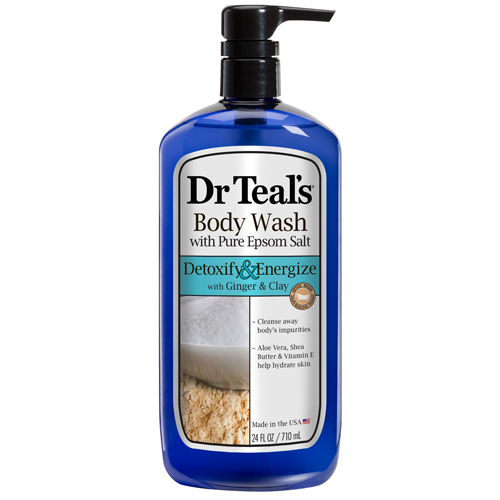 Apply a generous amount of Dr Teal’s body wash to hands, wash cloth or pouf. Gently massage all your body for ultra-moisture and total rejuvenation. 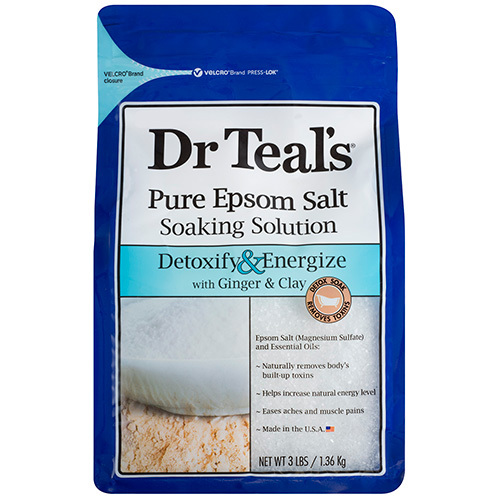 Dr Teal’s® Soaking Solution combines Pure Epsom Salt which has long been known to revitalize tired, achy muscles, with luxurious essential oils to soothe the senses and help provide relief from stress. Ginger and Clay help to cleanse away your body’s impurities while helping you feel more energized. 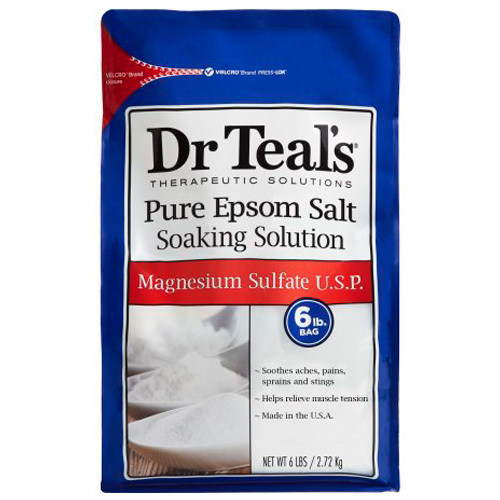 Dr Teal’s Epsom Salt Soaks combine pure Epsom salt (Magnesium Sulfate U.S.P.) with rejuvenating essential oils to help reduce inflammation, revitalize tired, achy muscles, and soothe the senses, which provides relief from stress. 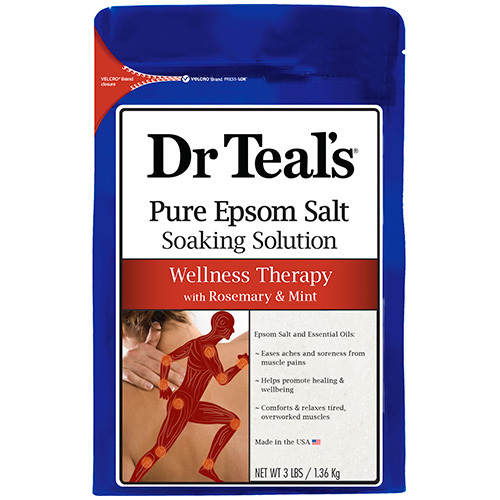 Dr Teal’s® Wellness Therapy Soaking Solution combines Pure Epsom Salt which has long been known to revitalize tired, achy muscles with luxurious essential oils to help provide relief from stress. Rosemary, Spearmint and Peppermint essence helps to soothe your body of daily stress while refreshing your mind and promoting whole body relief and wellness. 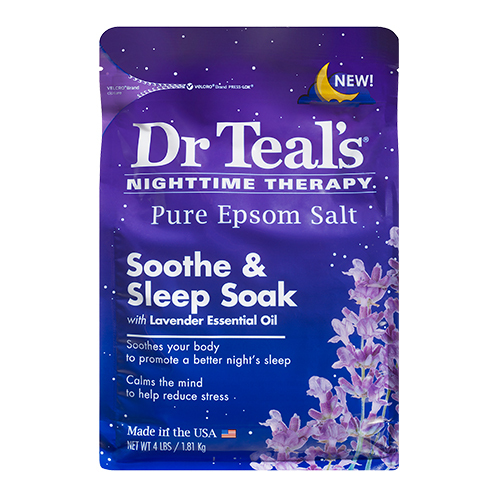 Relax & Unwind with Dr Teal’s Soothe & Sleep Pure Epsom Salt with Lavender Essential Oils. Epsom Salt helps relieve aches and pains, while the scent of fresh lavender soothes your mind and body, promoting better, deeper sleep. To promote a better night’s sleep, at bedtime pour at least 2 cups under warm, running bath water and soak for 20 minutes. Let the rich minerals absorb through the skin and take deep breaths to smell the lavender to soothe your body and mind. Available in 4lb. bag in Sleep section. Dr Teal’s Pre & Post Workout combines Pure Epsom Salt (Magnesium Sulfate U.S.P.) and Menthol, both known to comfort and relieve overworked muscles, allowing for optimum performance. Soak away sore muscles. Pour at least 2 cups of Dr Teal’s Epsom Salt under warm, running water to soak away sore muscles. Soak for 20 minutes to help speed recovery time. 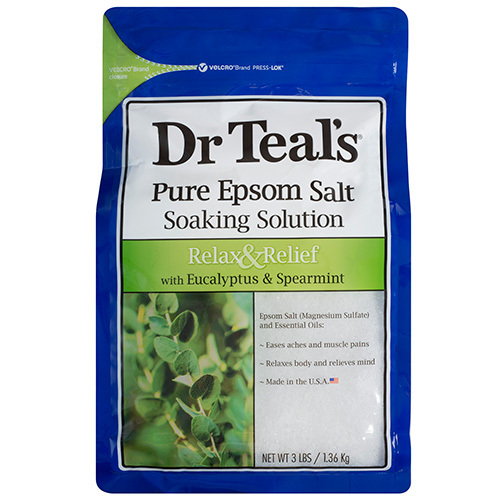 Dr Teal’s® Soaking Solution combines Pure Epsom Salt, which has long been known to revitalize tired, achy muscles, with essential oils to soothe the senses and help provide relief from stress. The essence of chamomile helps calm the mind and soothe the senses. Dr Teal’s Fragrance Free Soaking Solution consists of unscented Pure Epsom Salt (Magnesium Sulfate USP), which has long been known to help revitalize tired, achy muscles and help refresh skin’s appearance. Pair with Dr Teal’s Foaming Bath for an aromatic bubble bath, or Dr Teal’s Ultra Moisturizing Bath Bombs for a skin-nourishing soak. Available in a 4 LB Bag in the Bath section. Dr Teal’s Unscented Epsom Salt is made of pharmacy grade Magnesium Sulfate U.S.P. for whole body relief and wellness. Available in a 6 LB Bag in the First Aid section. 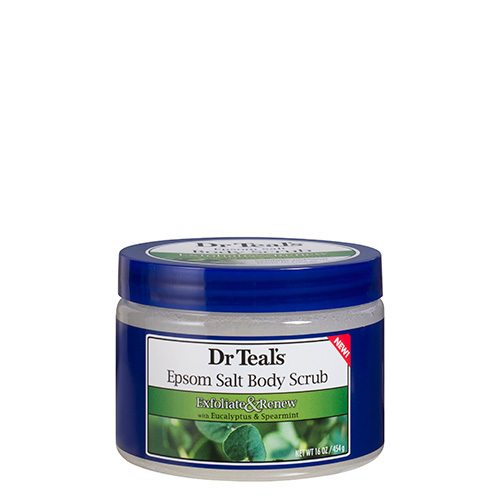 Dr Teals® Eucalyptus Epsom Salt Scrub is formulated with Pure Epsom Salt to gently exfoliate skin. Relaxing Eucalyptus essential oil soothes the senses, while Shea Butter and Jojoba Oil leave skin soft and moisturized. 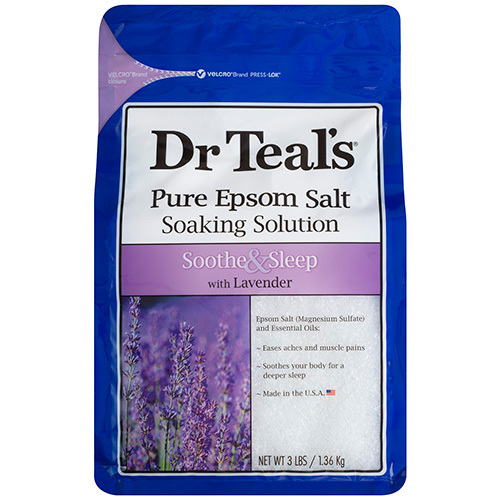 Dr Teals® Lavender Epsom Salt Scrub is formulated with Pure Epsom Salt to gently exfoliate skin. Lavender essential oil soothes the senses, while Shea Butter and Jojoba Oil leave skin soft and moisturized. Dr Teal’s® light-weight body lotion is formulated with moisturizing ingredients plus beneficial essential oils to nourish and renew skin. This restorative blend with Coconut Oil brings moisture back to your skin, leaving it soft and smooth. Available at all Walmart stores in the Skin Care section. Dr Teal’s Moisturizing Lavender Body Lotion delivers deep moisture to the skin plus all the benefits of aromatherapy for the mind. This rich blend of Cocoa Butter, Shea Butter and Vitamin E is infused with Lavender essential oil. Apply at night before bed or after a soak or shower to calm your senses and soothe your skin. Dr Teal’s Eucalyptus and Spearmint Body Lotion delivers deep moisture to the skin plus rejuvenating aromatherapy. This rich blend of Cocoa Butter, Shea Butter and Vitamin E is infused with uplifting Eucalyptus and Spearmint essential oils to refresh your skin and clear your mind. Dr Teal’s® light-weight body lotion is formulated with moisturizing ingredients plus beneficial essential oils to nourish and renew skin. This restorative blend with Bergamot and Sweet Orange essential oils will soothe away stress and help restore your skin’s natural balance. Dr Teal’s® Moisturizing Foot Soak, Softening Remedy is created with ingredients to soften and smooth your feet while easing aches and soreness. This delightful foot soak combines Pure Epsom Salt with a blend of Aloe Vera & Coconut Oil extracts to leave your feet noticeably soft, refreshed and moisturized. Dr Teal’s® Gentle Exfoliant is a foot care treatment specially formulated with a blend of Pure Epsom Salt & mineral salt to exfoliate away rough, dry skin. Enriched with super moisturizers, Aloe Vera & Coconut Oil, this scrub will leave your feet touchably softer and rejuvenated. 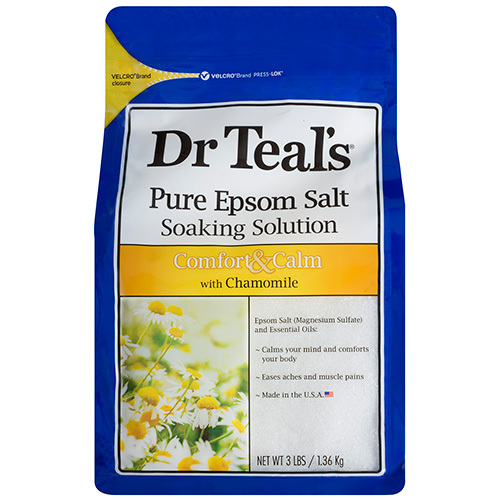 Dr Teal’s® Refreshing Foot Soak with Pure Epsom Salt is known to revive tired, achy feet. Peppermint essential oil and baking soda provides a cooling sensation to refresh and eliminate foot odor. Dr Teal’s® Shea Enriched Foot Cream is formulated with Shea Butter, Aloe Vera & Vitamin E to provide intense moisture and help prevevnt rough spots. Use daily to keep feet touchably smooth. Dr Teal’s® Foaming Bath transforms your bath into a relaxing spa with essential oils to soothe the senses, revitalize tired, achy muscles and help provide relief from stress. Lavender essence has soothing properties that are known to promote a better night’s sleep. 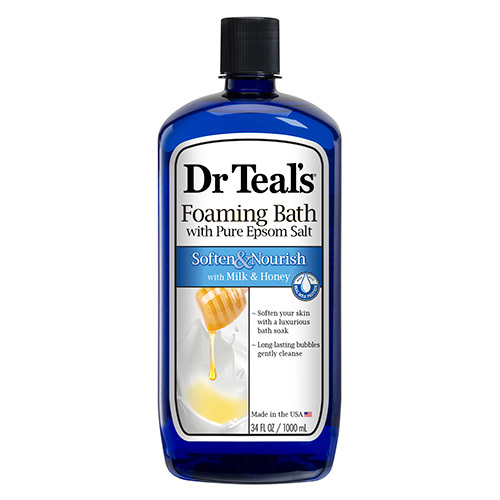 Dr Teal’s® Foaming Bath transforms your bath into a relaxing spa with essential oils to soothe the senses, revitalize tired, achy muscles and help provide relief from stress. Spearmint is used as a restorative for the body, while Eucalyptus stimulates the senses. “Dr Teal’s® Pink Himalayan Foaming Bath transforms your bath into a relaxing spa with luxurious essential oils to soothe the senses and help provide relief from stress. 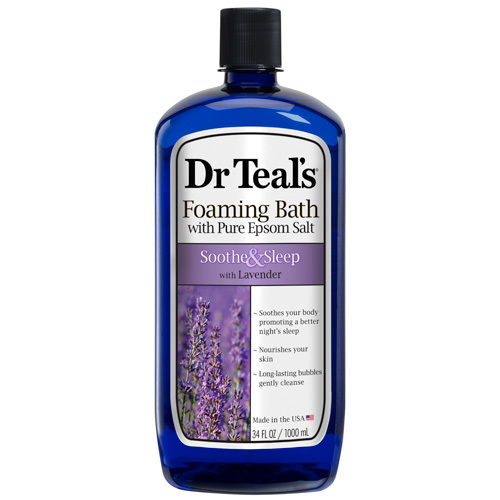 Dr Teal’s® Foaming Bath transforms your bath into a relaxing spa with essential oils to soothe the senses, revitalize tired, achy muscles and help provide relief from stress. Coconut Oil has long been known to moisturize skin and help soothe skin irritation. 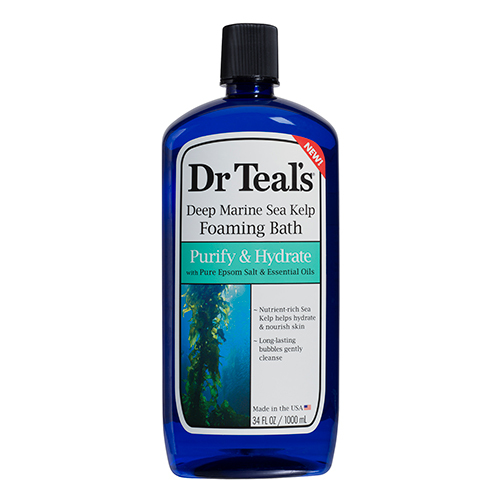 Dr. Teal’s Sea Kelp Foaming Bath transforms your bath into a relaxing spa with essential oils to soothe the senses, revitalize tired, achy muscles and help provide relief from stress. Nutrient-rich Sea Kelp helps purify and hydrate, while uplifting Lemongrass and Orange essential oils help sooth the stress. Dr Teal’s® Foaming Bath transforms your bath into a relaxing spa with essential oils to soothe the senses, revitalize tired, achy muscles and help provide relief from stress. Ginger and Clay help to cleanse your body by removing harmful toxins while helping you feel more energized. 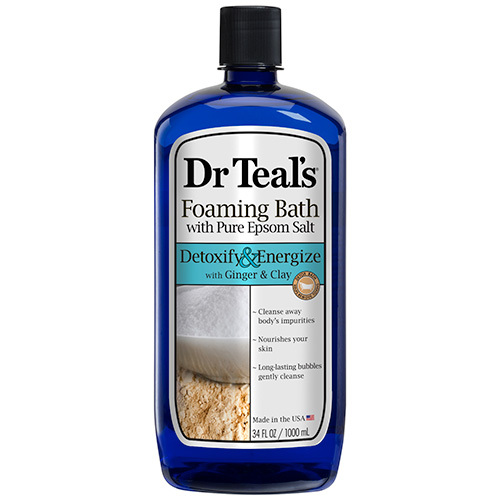 Dr Teal’s® Foaming Bath transforms your bath into a relaxing spa to soothe the senses, revitalize tired, achy muscles and help provide relief from stress. Soften your skin with a luxurious soak with Milk & Honey. 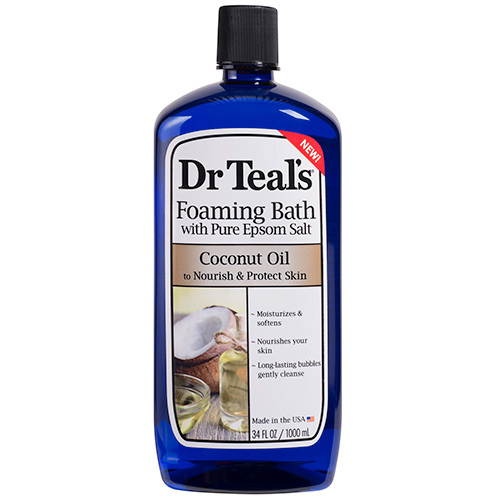 Dr Teal’s® Foaming Bath transforms your bath into a relaxing spa with essential oils to soothe the senses, revitalize tired, achy muscles and help provide relief from stress. Calm your mind and comfort your body with the essence of Chamomile. Dr Teal’s® Ultra Moisturizing Foaming Bath transforms an ordinary bath into a relaxing spa. Foaming bubbles deliver soft, creamy aromatic notes, while Super Moisturizer Avocado Oil helps to moisturize and soften skin. Dr Teal’s® Ultra Moisturizing Body Wash hydrates, conditions and moisturizes skin with Aloe Vera, Shea Butter and Vitamin E, while Pure Epsom Salt helps revitalize tired, achy muscles. Soothe body and mind with Lavender essence, which has soothing properties that are known to promote a better night’s sleep. Dr Teal’s® Ultra Moisturizing Body Wash hydrates, conditions and moisturizes skin with Aloe Vera, Shea Butter and Vitamin E, while Pure Epsom Salt helps revitalize tired, achy muscles. Relax and relieve body and mind with Eucalyptus and Spearmint. Spearmint is used as a restorative for the body, while Eucalyptus stimulates the senses. Dr Teal’s® Ultra Moisturizing Body Wash hydrates, conditions and moisturizes skin with Aloe Vera, Shea Butter and Vitamin E, while Pure Epsom Salt helps revitalize tired, achy muscles. Cleanse away body’s impurities with Ginger and Clay, helping you to feel more energized. Dr Teal’s® Eucalyptus & Spearmint Body Oil soothes dry skin and seals in moisture. This gentle formula absorbs quickly and is perfect to use after your shower or bath. Add to your bath to enjoy the relaxing scent of Eucalyptus & Spearmint and to moisturize while you soak. 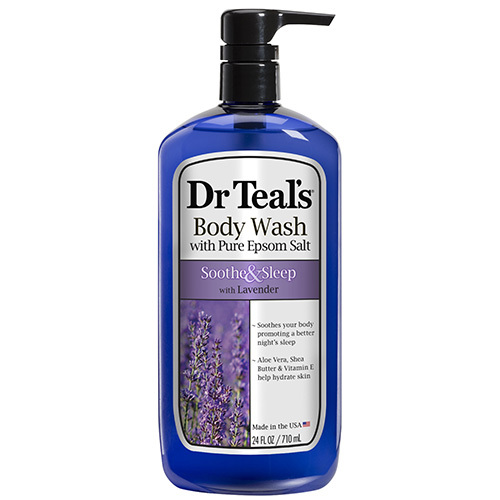 Dr Teal’s® Lavender Body Oil soothes dry skin and seals in moisture. This gentle formula absorbs quickly and is perfect to use after your shower or bath. Add to your bath to enjoy the soothing scent of Lavender and moisturize while you soak.